Two men were remanded in custody on Tuesday accused of having a wheel brace and iron bar to inflict injuries on a kidnapping victim. Gary Rafferty, 32, and David Nixon, 30, appeared at Belfast Magistrates Court over their alleged involvement in the attack in the north of the city. Police believe a man in his twenties was beaten after getting into a car at Jellicoe Avenue on Sunday evening. Up to four men are suspected of assaulting him as the vehicle was driven to a lay-by on Flush Road. According to investigating detectives the man then made his way to a nearby house and raised the alarm. He sustained a broken finger, puncture wounds to both legs, gashes to his face and an eye injury that will require surgery, police said. Raffery, from Kinbayne Avenue in Greenisland, Co Antrim, and Nixon, of no fixed abode in Belfast, are jointly charged with kidnapping and causing grievous bodily harm with intent. Both men face a further count of possessing offensive weapons, namely a wheel brace and iron bar, with intent to commit kidnapping. 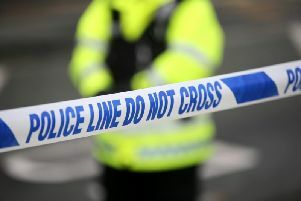 Standing together in dock wearing handcuffs, the two accused spoke only to confirm they understood the alleged offences. Defence lawyers put no questions to a detective constable who connected their clients to the charges. With neither accused making bail applications, District Judge Fiona Bagnall remanded them in custody to appear again by video-link next month.